Shopping for a new INFINITI QX80? Infiniti protects packages with prerequisites that can frustrate shoppers. We’d opt for active safety and never look back—base models are still well-equipped. Big, luxury SUVs like the 2019 Infiniti QX80 feed our macho egos. This year, Infiniti made standard automatic emergency braking on all versions of the QX80. The life-saving technology should give big families peace of mind—some competitors haven’t yet followed suit. Offered in base or Limited trim levels, the QX80 packs a bevy of luxury features into the big SUV for about $66,500 to start. Every model gets a hulking V-8 under the hood that makes 400 horsepower and 413 pound-feet of torque, mated to a 7-speed automatic transmission. In addition to lugging the QX80’s colossal mass, the QX80 can tow up to 8,500 pounds when properly equipped. Physics will fight the QX80 around corners, but Infiniti offers a hydraulic body motion control system that can help. Steering is still a chore, however; the big ‘ute handles like a blimp. The interior of the QX80 helps us forget all that. Three rows of seats are standard, swathed in leather (upgradeable to supple nappa hides), with plenty of room. The third row is power folding on all versions, which opens up the cargo room beyond the 16.6 cubic feet with all three rows in place. We’d spec a base version with four-wheel drive and active safety features such as blind-spot monitors and adaptive cruise control for about $75,000. Every QX80 is equipped with 20-inch wheels, power liftgate, power-adjustable heated front seats, leather upholstery, second row captain’s chairs, power-folding third row seats, premium audio by Bose, forward-collision warnings with automatic emergency braking, and an 8.0-inch touchscreen for infotainment with navigation and Bluetooth connectivity. Options packages can add tens of thousands more, but its value falls down compared to newer competitors. Refined and ritzy, the 2019 Infiniti QX80 has aged in ways we wish we all could. Designers updated the Infiniti QX80 last year with good effect. Gone is the underbite and unnecessary bling, sharp headlights and a better grille took its place. The most notable improvements happened up front on the QX80. Its nose is less pronounced, and a mesh grille holds a floating badge that classes up the look in ways the prior versions fumbled. Infiniti ditched the Pep Boys-esque side grilles for a single piece near the front doors. There’s not much style to be found along the sides, which don’t bother to hide the prodigious amount of sheet metal with creases or other light tricks. In back, the QX80 runs away from its old, bulbous rump. (The Armada still has it, however.) The rear bumper is smaller, and the tailgate gets new lights that look more modern and befitting its price tag. The interior feels like a quiet study with many impressive leather-bound editions. It’s almost as old—some places have hard plastics that others have since ditched. Dressed in upscale hides with quilted leather, the QX80 doesn’t disappoint in its stately appearance. The 2019 Infiniti QX80 blends old-school power with old-school handling for a big luxury SUV. The 2019 Infiniti QX80 parties like it’s 2006. Instead of fuel-efficient turbocharged engines, hybrid batteries, or transmission trickeration, it’s saddled with a big V-8 and 7-speed automatic that deliver predictable performance. It’s an old-school powertrain with old-school power delivery: at the low end of the rev range, in big dollops. Properly equipped the QX80 is rated to tow up to 8,500 pounds, enough for weekend toys or a camper, much lower than Suburbans and Expeditions. The QX80 never feels short on power, nor does it feel particularly rushed. A two-speed transfer case on 4WD versions adds confidence when the boulevard turns into a boulder field, but big 20-inch wheels (upgradeable to 22-inchers) don’t beg for off-road duty. New last year, Infiniti added a hydraulic body motion control system that can keep the big SUV from pitching like a regatta in a rainstorm. The system is standard on Limited versions and a spendy extra on base trims. 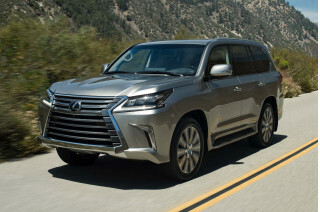 It keeps the QX80 controlled around most corners, although physics may have different ideas for the top-heavy SUV that weighs more than 5,900 pounds for drivers with heavy right feet. In any scenario, the QX80 is equipped with a fairly slow power steering setup that’s not very quick in the name of long-distance comfort. Maneuvering the SUV around a parking lot is a workout; the wheel is light but takes many turns. The 2019 Infiniti QX80 has luxury bona fides, beginning with a quiet ride and spacious cabin. 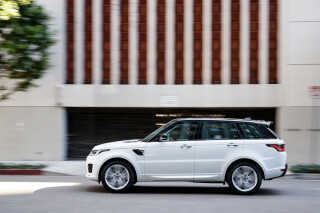 Big luxury SUVs should be nothing but comfortable first. Like other big SUVs, the 2019 QX80 has a tall, upright seating position with a good view of the road ahead. The standard leather upholstery is impressive, and the soft hides on Limited versions are opulent. Regardless of interior material, the seats up front are spacious and supportive, all-day comfortable for long trips. Every QX80 gets standard heated front seats, and many will offer cooled front seats via an options package. The second row are captain’s chairs as standard, although a second-row bench can be swapped in for $250. There’s plenty of leg room with 41 inches as standard, and tall adults will find plenty of head room in the back. We’d stop short of asking any adults to crawl into the wayback, however. (Unless those adults are fussy coworkers—Eds.) The third row sports a scant 28.8 inches of leg room, which means it’s best left for children on the regular. Bad news: Just 16.6 cubic feet of cargo room is available behind the third row. Good news: A power-folding third row is standard and opens up cargo room to more than 25 cubic feet. Regardless of trim level, the QX80 glides comfortably and quietly down the road. Active noise cancellation keeps the big 20-inch standard wheels from filling the cabin with constant drone from the tires, and the optional air suspension controls its motions well. 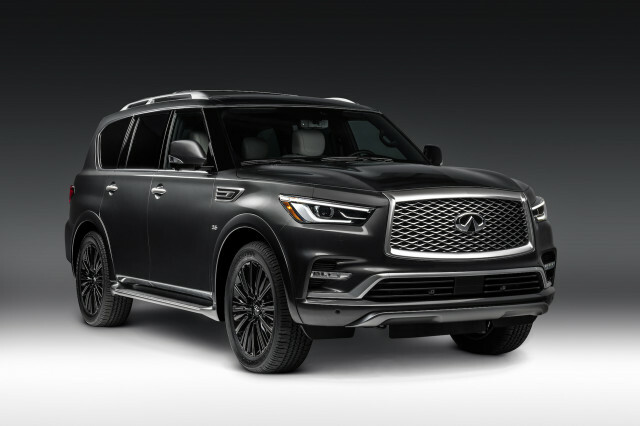 The 2019 Infiniti QX80 lacks official crash tests. Federal and independent testers don’t have the guts or the money to send an Infiniti QX80 headlong into a wall. This year, the QX80 is equipped as standard with forward-collision warnings with automatic emergency braking. Optional extras include blind-spot monitors, adaptive cruise control, lane departure warnings, adaptive headlights, active lane control, and a camera-based rearview mirror. Infiniti bundles most of the common-sense safety features in a $2,550 option package on base versions, while Limited models get the good stuff bundled into the $90,000 price tag. Blind-spot monitors aren’t just ideal for the big QX80, they’re practically mandatory. The big SUV could hide Kansas in its rear three-quarter view. The 2019 Infiniti QX80 has all the right hardware for a luxury SUV. If only its software could be updated. For more than $66,500 to start, the 2019 Infiniti QX80 is well-equipped—at that price we’d hope so. 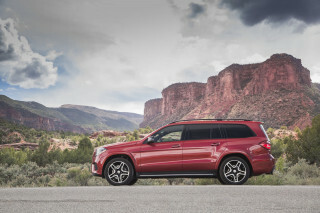 A long list of optional features keeps the aircraft carrier-sized SUV in the race with other luxury competitors, but many of the options feel a few years past their sell-by date. Infiniti offers the QX80 in two trims: base and Limited. Four-wheel drive is a $3,100 proposition on base versions and is standard on Limited versions. From scratch, the QX80 gets 20-inch wheels, power liftgate, power-adjustable heated front seats, leather upholstery, second row captain’s chairs, power-folding third row seats, premium audio by Bose, forward-collision warnings with automatic emergency braking, and an 8.0-inch touchscreen for infotainment with navigation and Bluetooth connectivity. Apple CarPlay and Android Auto compatibility aren’t in the QX80’s vocabulary. At more than $90,000, the QX80 Limited goes unlimited on the budget and options and adds open-pore wood, supple quilted hides, heated and cooled front seats, heated second-row seats, dual 8.0-inch screens for rear seat entertainment, active safety features that we cover above, and an air suspension. Most of the features found on the Limited trim level can be added a la carte on base versions, provided shoppers tick the right options boxes in the right order. That makes our value pick for the QX80 toward the base version, where active safety and four-wheel drive can keep the big SUV on the sane side of $75,000. No amount of money can improve the QX80’s infotainment system, which feels like VHS compared to other high-def displays. Compounding its woes are a bevy of buttons underneath that sometimes perform redundant tasks to other buttons. It’s not a deal-breaker, but it’s also outdated the minute it leaves the dealer’s lot. The 2019 QX80 won’t pass many gas stations without stopping. All versions of the QX80 are rated for premium fuel. Big SUVs without hybrid batteries don’t do well on our scale. 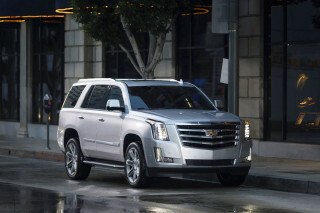 The Cadillac Escalade is EPA-rated up to 17 mpg combined, and the Lexus LX does worse at 15 mpg combined. 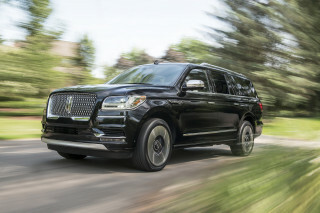 The Lincoln Navigator nets a 19 mpg combined rating, provided drivers are very judicious with their right feet. Looking for a different year of the INFINITI QX80?